BC killer whales can’t hear each other! I spent much of 2010/2011 working on a research project so thought that I would use this ultimate SCIE300 blog post to tell you all about it. Last September, myself and four others in UBC Environmental Science were put on team and instructed to research whatever environmental science topic we wanted. We were all broadly interested in researching some sort of ecological impact of the Gateway Program, BC’s massive plan for highway and port expansions. We spent first semester narrowing in on a more specific area. Eventually, we landed our focus on the impacts of increasing commercial shipping traffic on the Southern Resident killer whales (SRKW). This population is designated as endangered by the Species at Risk Act and has been in decline over the past several decades. This semester, we went into a research paper-reading frenzy on everything and anything to do with killer whales, ships, and killer whales and ships in order to find a manageable gap in the understanding of commercial ship impacts on the SRKW we could work to fill. We soon found that the influence of commercial shipping sound in the SRKW critical habitat — area identified as especially important for the well-being of this species — is little understood. Also at around this time, a lawsuit led by several environmental groups against the Department of Fisheries and Oceans (DFO) was in the midst of unfolding. 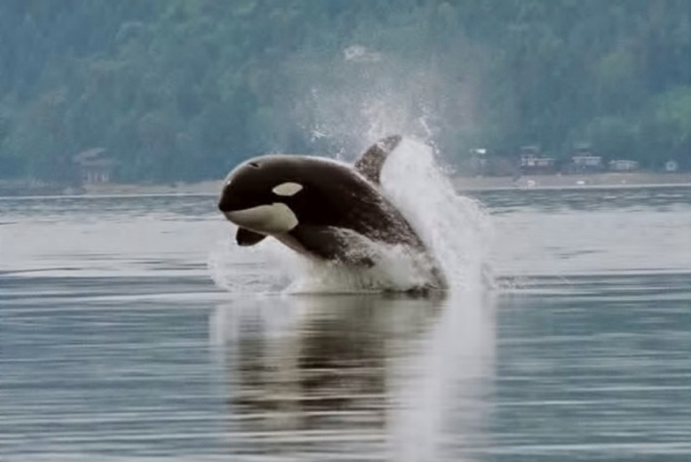 Team Enviro had taken DFO to court for failing to protect the SRKW critical habitat (which DFO is legally obliged to protect), and in December 2010, the court ruled against DFO. Noise pollution — along with food availability and toxic pollution — were among the key areas DFO was found to be failing to address. So, knowing that DFO might be considering doing a better job of safe-gaurding the critical habitat, we wanted to conduct research that could inform recommendations to lessen noise impacts on the SRKW. We got to work using GIS analysis to map out areas of sound influence in the SRKW habitat, identifying spots where the killer whales’ ability to communicate was compromised. In addition, we mapped out noise pollution scenarios under different ship speed limits to see whether the noise level decreased significantly. 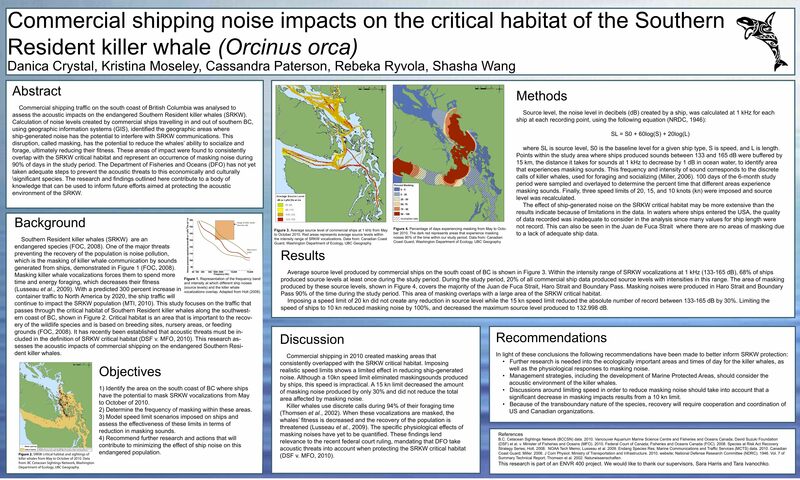 In the end, we found that noise pollution is omnipresent in the SRKW critical habitat; the whales are almost never freed from some sort of interference in their communication calls. Additionally, we found that no realistic speed limit reduces noise significantly. What does this mean for the SRKW? Mostly, our research reiterates that DFO has done a poor job in protecting the home of this endangered species. However, we believe that future research into alternate shipping routes and identification of specific months or times of day for shipping that avoid critical killer whale feeding and breeding times and areas could lead to successful SRKW protection. Our poster we presented to the EOSC faculty. You should be able to read it by clicking on it. This entry was posted in Biological Sciences, Environment, Issues in Science, Science in the News and tagged commercial shipping, Ecology, Environmental Science, Gateway Program, GIS, killer whales, noise, ocean, research, ships, SRKW. Bookmark the permalink. Are you in ENVR 400? I just heard about your research today in another class! This project seems like such a huge undertaking for only a handful of students. You should be so proud of your work, it is awesome! I never think of noise pollution as having the power to affect animals, so this work really opened my eyes to the damages it can cause. I like how it is addressing a current issue. It may seem like a simple solution to just put these whales on the ‘endangered list’, but it is good to know that someone is being held accountable for not actually helping them. Your post brings up another example of how drastic we affect the environment without really realizing it. Just quick question, did you end up presenting your findings to the DFO or anyone else involving in protecting these whales?